The International Species Information System (ISIS) is an international non-profit organization serving zoos and aquariums . ISIS provides its members with zoological data collection and sharing software called ZIMS - the Zoological Information Management System. The World Association of Zoos and Aquariums (WAZA) is the "umbrella" organization for the world zoo and aquarium community. Its mission is to provide leadership and support for zoos, aquariums, and partner organizations of the world in animal care and welfare, conservation of biodiversity, environmental education and global sustainability. The Association of Zoos and Aquariums (AZA) is a nonprofit organization founded in 1924 dedicated to the advancement of zoos and public aquariums in the areas of conservation, education, science, and recreation. The European Association of Zoos and Aquaria (EAZA) is a nonprofit organisation for the European zoo and aquarium community. ZooLex - Your free access to international zoo design. Zooinstitutes.com - "This site is an expression of my emotions as well as a tool to find like-minded people among zoo fans." Alex Kantorovich's website about zoos. 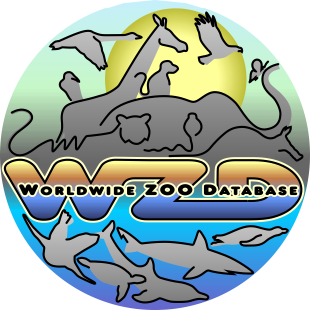 WZD (Worldwide ZOO Database) - Database of all world zoos, safari parks, bird parks, aquariums, dolphinariums, terrariums, insectariums, butterfly houses etc., not only of large but also of mini-zoos and other small facilities - simply of all expositional zoo-facilities and several special breeding centres, including the former (closed) zoos, menageries and so on (from prehistory to present time). It is not only common list of zoos, but contains also many information, maps, photos, short videos etc. The database is still not complete, but is made incessantly, the other zoos are added continuously. Zootierliste.de - zootierliste is a database for the current and former vertebrate inventories of European zoos and other public collections. Zoos Worldwide - an extensive list of zoos, aquariums, animal sanctuaries and wildlife parks worldwide, Zoos Worldwide started in 1999 as a small list of zoos. Following a re-launch on the first day of 2013, the list now includes locations to see wildlife in their natural surroundings as well as the traditional zoo or aquarium. You can also find us on Facebook, Google+ and Twitter.